Hotel was in good location and split in four diffrent blocks. We were in block D across from main part beside the quiet pool. We stayed at Laguna Park all inclusive. Hotel was very clean rooms where done everyday with clean towels although they never put enough toilet rolls in we had to ask at reception for them cleaners where not friendly never smiled. Food was OK if you are not used to good cooked breakfast was served with cold fried eggs which was stood after been cooked till they were cold before they where put out. What they called bacon wasn't and hot dog sausages. Was not nice. Dinner was OK if you had chips and spuds, rice was cold not a very good variety, same was served at tea time only thing from snack bar worth having was hot dogs. Would not rate as four star .they need to change the menu to become a four star. Wont be going back to this hotel again in the future. We travelled on the 16th of August 2010, we stayed in the Laguna Park hotel, it was very clean and rooms done daily(though we were in the recently refurbished part). The hotel staff were arrogant and ignorant, they did not smile at you say please or thank you (found out this is everywhere you go in sunny beach). When you were talking to staff they would make it obvious they were talking about you to other staff. The hotel was very strict, my son and girlfriend stayed in another hotel and came to visit the security guard chased them out saying they were not allowed in to visit, if you had a night flight and were put out your room at 12pm you were not allowed to fall asleep in the lobby on the sofa chairs this included kids, if you did you were found 50 lev which is £25.00. The food was ok if you liked pink chicken /fish or rice this was the daily menu, there was chicken nuggets on one day for kids, you get as much free drink as you want though the beers are a small half pint so you have many trips to the bar. You need to get up at 6am for a bed round the pool, and believe me if you go to the entertainment you sure won’t be going back, we tried it on the 2nd night, it was a couples quiz. They had 3 sets of friends back to back asking each one something about the other and they had to put thumbs up or down, 3 mins of this was enough. I went to my holiday rep for advice about our bus times, she stood up looking quite annoyed I disturbed her on her mobile, she then said go and look in file on counter not my problem there was no can I help or a smile, I went to look in the file which give you details about Bulgaria so we went back before I could even ask the question she shouted, ‘What now?’, people were disgusted at her attitude, how she has a job I’ll never know, the British reps are obviously told to help you! Another tip, walk on the roads its safer as the Bulgarians will not move for you and believe me they will push you out the way, though be careful on the roads as they obviously let anyone drive a car at whatever speed they want, we go on holiday every year and certainly won’t be going back to Bulgaria. 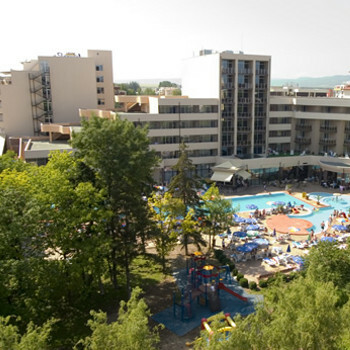 I was unsure about travelling to Bulgaria simply because I had not heard alot about it, however I was looking for somewhere not too far on a plane and at a fair price. So when I arrived at Laguna Park I was more than pleased with the choice we had made. We were travelling on our Honeymoon and when taken to our rooms at 5.30am were greeted with a bottle of champagne and a card from the staff. Attention to detail was excellent and even though our arrival was at silly o'clock the hotel opened the restaurant for snacks. Our room was on the 5th floor and the hotel is divided into sections which is a great idea as it dosen't feel like a throughfair in the corridors like some hotels. The lifts always worked, but I chose not to use it due to my own fears. Food was excellent and although the hotel is quite large there was always a table to sit at regardless of what time we entered the restaurant. Breakfast was typical poor sausages and bacon which shouldn't even be called that, but there was so many other choices even eggy bread and pancakes. Lunch was just as good and at dinner there was plenty to choose from if you eat more than just chips!! You could never get hungry as the snack bar was open all day and there was also ice cream and biscuits in the main bar. The entertainment staff worked hard all the time, but the evening entertainment wasn't my cup of tea as it was fairly basic including bingo and kaeokee. Ivan and the team were great his now my new friend on facebook! they weren't too pushy and actually stopped to chat not just to get you out of your seat to join in. I did water aerobics ever day and there were lots of other sports to do. The staff were friendly and boris on the outside bar kept us entertained. The only down side was that we went whilst the world cup was on and even though there was nearly 20 TV's in the hotel every single one had football on! I could even watch the football from my 5th floor balcony as they put an additional screen outside, it would have been nice for just 1 TV to have had no football on it, so we went out instead. The hotel was near to the beach and bars but not too close for the noise to be intimidating. There was also a gym at 6lev a day and a hairdressers and massage palour, which I would recommend the full body massage for 50 lev. Safety in the hotel was excellent nothing went missing out of our rooms. I would love to go back to Laguna Park and have already recommended it to everyone. hotel was spotless clean , beds made everyday and fresh towels every day. we were all inclusive-food was ok but as usual into second week food repetitive , soups were really nice. entertainment team were good during day water polo,shuffle board,aerobics, darts ect you could join in if you wanted , night time entertainment- we didnt go to this mainly due to where you had to sit old wooden benches in an auditorium setting and no bar there.bar staff were not unpleasant but not pleasant either. i would recommend laguna forfamilies felt very safe in hotel. we went last year to sunny beach and had a really good holiday we said we wanted to go back again this year but to try a different hotel.we picked laguna park we got a really good deal and payed the same as last year but all inclusive and thought if the food was not very good we could always eat out as its so cheap.what areally great hotel, very clean lovley room with large balcony overlooking the pool.We got fresh towels every day and the beds changed three times a week,the cleaner was shy but always smiled at my little boy and would leave the sheets in pattens on the bed.the food was good but not fantasic and the soup was really nice, but not agood selection for children my little boy lived on chips most of the time. the hotel was in a great positon close to everything but not to close to any nightlife noise and easy walking distance to the beach.the entertainment was fantasic ivan and the team were great so cheerful pleasent and helpful.There was plenty to do for all ages and not to pushy to get you to join in even my shy 5 year old son went to the safe childrens club as he loved the girls so much. i would recomend this hotel and will be going back next year for sure. Hotel was generally clean, cleaners all friendly and eager to make sure room is clean even down to folding pyjamas! Our board was bed and breakfast, didn't eat there otherwise. The breakfast caters for most people, there is not english breakfast as such but there were fried eggs, tomatoes and some kind of baoon. The breakfast was more continental. The location was ideal! not too close to noise but close enough thst you didn't have to walk far to go shoppping, food, bars or beach. The staff were very friendly but not all spoke english. The pool was a good size but there was some sand by the pool and in the pool due to a sandpit close by. Hotel in a great location and good for children as the pool was child friendly with lots for them to do in it. The breakfast was ok but not a great choice of food it would have been nice to have more fresh fruit and choice of yoghurts to suit everyone.The staff where friendly and helpful most of the time but when I complained that my mini bar was not fully stocked she said imposible ( I did not use it but did not want to be billed for drinks missing ).I then complained that the curtains where falling down and I had no hand basin plug, the curtains where put back up but due to a broken track just came down again and no sink plug turned up at all, I shared one.My room was not hoovered once in two weeks it was dusty and a crisp on the floor that was there when I arrived was still there when I booked out.On a good note the towels where changed every day and the bed once a week,I do think that this could have been a lovely hotel but has become tired and in need of a refurbishment,I was also unlucky that my view was a white wall and a corridor window, but Sunny Beach made up for all of that and I had a great holiday.